A family of bottlenose dolphins epitomize the free nature of the open sea. Each dolphin swims freely among the sculptured ocean waves. Brand new wildlife sculpture with artist signature and copyright. Available as a single "Break Away" dolphin also. Chris Dixon Studios is proud to present 'Free Spirit III Dolphins' as a registered, limited edition sculpture of 1500. This is truly a magnificent marine mammal sculpture. Each issue comes with a certificate of authenticity, signed and numbered by the artist. 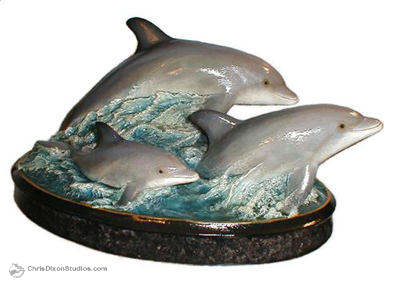 Surf with this dolphin family to your home! The bottlenose dolphin is an intelligent air-breathing mammal understandably a favorite among the fishing, boating, and diving set. Most everyone is attracted to the dolphin's smile and playful agility and grace. Dolphins are also very worthy of a good story. Stories of dolphin and human mutual benevolence abound throughout the ages. Like any intelligent animal dolphins may also be very dangerous. With strong tails and sharp conical teeth (and the smarts to hit the gills) they are among the few creatures capable of defending against a hungry shark.